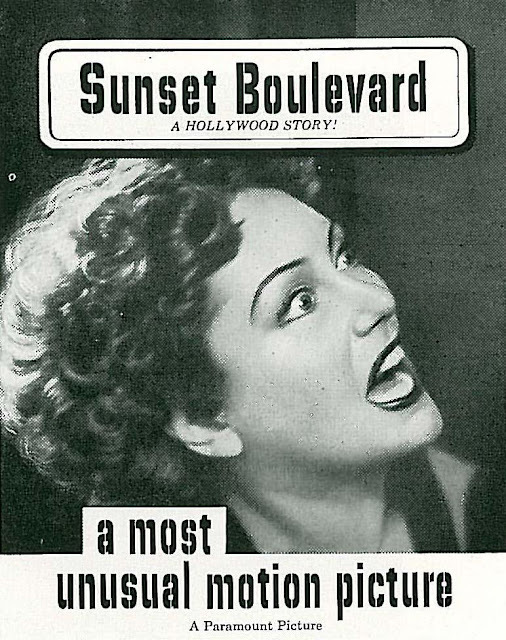 For Paramount, Sunset Boulevard was an idea whose time had come, but no one expected such poisoned brew a mere two years after the studio's bouncy and energetic The Perils Of Pauline, its nostalgic optimism personifying a town proud for having taken care of its own. Who was Billy Wilder to dredge up ugliness that could only discredit an industry reeling from court ordered disposal of affiliated theatres and the oncoming locomotive of television? Louis Mayer said it best after that invitational screening. How dare this young man, Wilder, bite the hand that feeds him? If indeed the director replied as he’d later claim, to wit --- I am Mr. Wilder, and go f--- yourself, then I’d not argue Mayer’s justification in attacking him. For the record, however, I don’t believe Wilder said any such thing. Long dead ogres like L.B. made easy marks for self-servers bragging of how they stuck it to the Hollywood establishment. 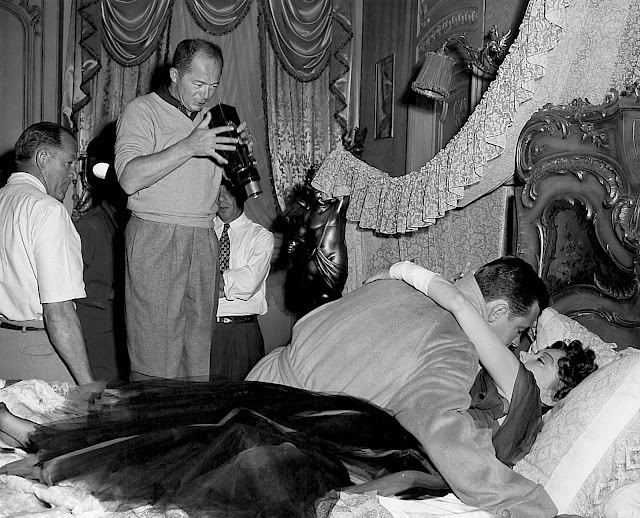 Wilder was fortunate that his movie turned out so well. Otherwise, he might have been run out of the business on a rail. Fifteen years and Kiss Me, Stupid finally tripped and felled the director on his vaunted outrageousness. Lucky for us Wilder had sufficient youth and cheek in 1949 to bring off a project that all but heaped manure in his own back yard. 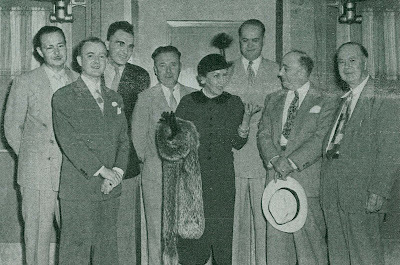 Paramount’s Henry Ginsberg hosted a reception for studio executives in March 1949. At that time he announced the coming slate of releases. Notable here were special invited guests representing old Hollywood. The photo above shows a proud assemblage --- (L to R) William Farnum, Mack Sennett, Adolph Zukor, Gloria Swanson, Cecil B. DeMille, and Hedy Lamarr. Sennett’s story would be brought to the screen, said Ginsberg. A golden era of comedy promised laughter for a new generation. Contemporary stars Betty Hutton and John Lund, reunited after the success of The Perils Of Pauline, were set to play Mabel Normand and Sennett. It would be a nostalgic tribute to that quaint, but still vital period, recalled with affection by several generations of moviegoers. Old-timers and flickers they made had long been objects of gentle mockery. 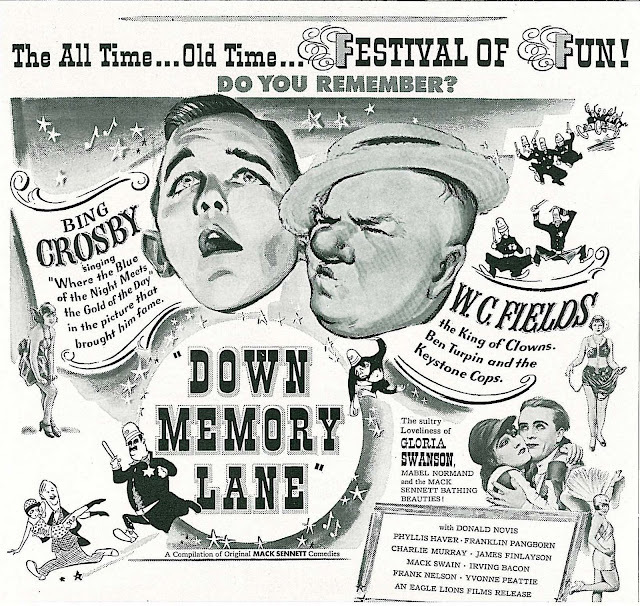 All in fun were shows like Hollywood Cavalcade and Glamour Boy, wherein industry cast-offs gave fleeting encores for fans who remembered. Serious attention was less often paid to those discarded. Blanche Sweet was a silent star down on her luck in Warner’s 1930 Showgirl In Hollywood, an early occasion to recognize damage done by the microphone. Director Robert Florey appreciated the career ruin brought on by talkies. His 1936 Hollywood Boulevard, also from Paramount, portrayed in realist terms the desperation felt by once major names, now footnotes. Warners would throw a twentieth anniversary screening of Don Juan in 1946 for cast and crew survivors, the object being less to pay tribute to their heyday than to celebrate two decades of sound that had displaced them. Betty Hutton’s Pearl White in The Perils Of Pauline had little to do with an actress by then comfortably deceased, and little ailed William Powell’s curmudgeon matinee idol in 1949’s Dancing In The Dark beyond need of a few week’s work in talkies. As if to confirm the hopelessness of Norma Desmond’s proposed Salome remake, late 40’s revival of silent films was virtually non-existent outside museum screenings. By way of gauging background, I came across tentative bids to relive past times while Sunset Boulevard was being prepared for release. 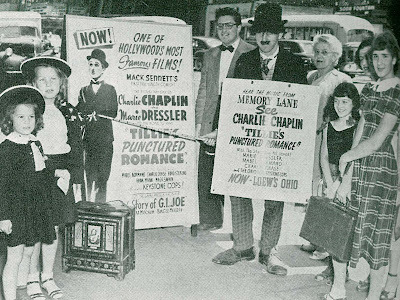 Then, as now, people’s interest in antique movies was limited to those they could laugh at. 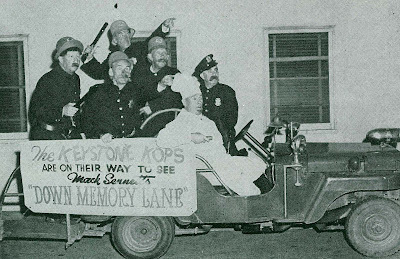 Fox West Coast ad manager Seymour Peiser dug up the original Keystone Kops as ballyhoo for his November 1949 booking of Down Memory Lane, a Mack Sennett compilation with as many sound highlights as silent ones (note Gloria Swanson’s prominence in the ad shown here). Another from Sennett, Tillie’s Punctured Romance, occasioned a Chaplin lookalike contest, these a staple since the teens. 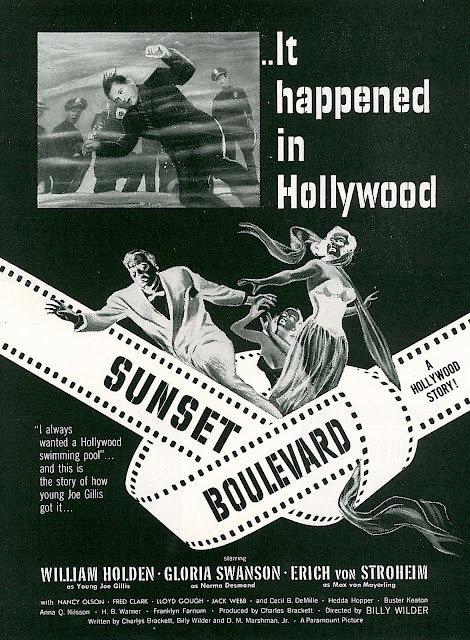 Indeed, Chaplin himself would reissue City Lights just ahead of Sunset Boulevard’s 1950 opening. 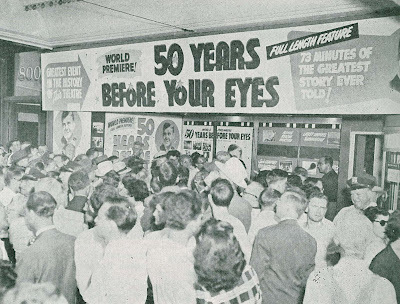 Warner Bros. compiled newsreel and entertainment footage for a backward look called Fifty Years Before Your Eyes. 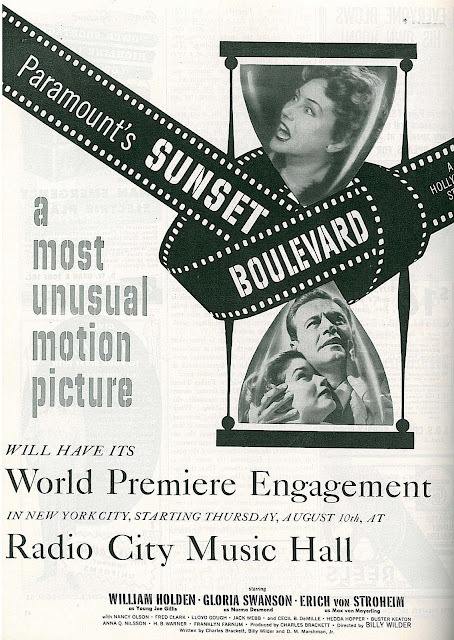 That opened in five NYC newsreel theatres during July 1950. 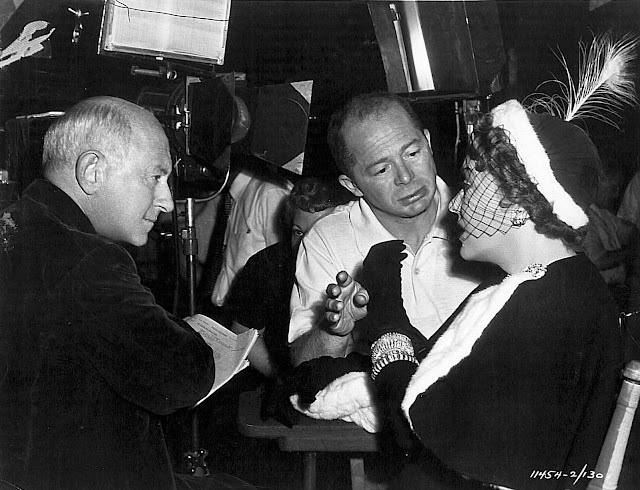 Producer Robert Youngson treated modern viewers to glimpses of Valentino and Ben Turpin, among many others. It’s hard to believe an era just twenty years gone could be so irretrievably lost. Silents were stone age relics best left on scrap heaps, or worse, bonfires to which studios consigned non-talking libraries. Silent films were more suppressed by the industry than forgotten by those who’d attended them. They were an affront to progress supposedly made between 1927 and 1949. Such passage of years made Wilder’s gothic treatment credible to audiences who viewed silent stars as things ghostly and suggestive of decay. I can only imagine how Mary Pickford felt when Paramount's team went to read her the script. Brackett and Wilder were casting about for an authentic silent name to play Norma, but withdrew in the face of Pickford’s horrified reaction. How could she, or anyone of her generation, respond otherwise in the face of such insulting depiction? Gloria Swanson did her heaviest lifting as Paramount’s roving good will ambassador between October 1949 and August 1950. She was on studio payrolls for, all told, over a year. Upon completion of principal photography, GS hit the road for purposes of increasing the public’s regard for an industry still vulnerable to scandal and condemnation. The Ingrid Bergman stink was hot news and so was a Senate probe into Un-American activities. Swanson combated ramifications of both in hundreds of radio and television appearances nationwide. Emphasizing Hollywood’s good works, she lectured before civic organizations, women’s clubs, and charitable groups. The thousand a week Swanson earned obliged her to thump for The Heiress as well. Paramount knew it could build anticipation for William Wyler’s prestige drama with assist from a well-known and articulate spokesperson. This wouldn’t be the last time a silent luminary was called upon for lecture touring. 20th Fox sent Francis X. Bushman out in support of David and Bathsheba two years later. Silent stars were assured of recognition among community leaders of a generation less likely to recognize contemporary names. A Gloria Swanson as keynote speaker at your Kiwanis Club carried more cache among local opinion makers than a Joan Caulfield would have. 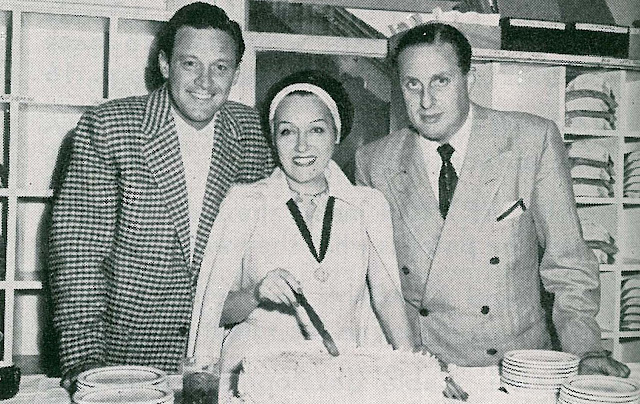 The cake cutting shown here was in recognition of 20,000 miles Swanson logged on behalf of Sunset Boulevard, the second wave on her cross-country schedule. That’s co-star William Holden and Paramount advertising-publicity director Norman Siegel flanking her. 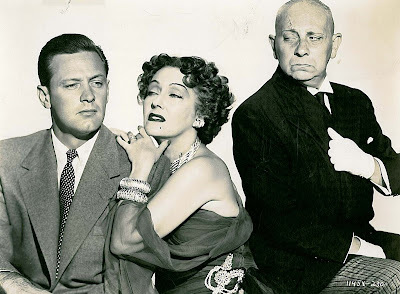 The Academy Award nomination was well-deserved recognition for a great performance, but I wonder if Gloria Swanson wasn’t actually better off before her own image became so confused with that of Norma Desmond. Part Two of Sunset Boulevard will go up on Monday. "Manufacturado exclusivamente para Max Glücksmann por The Argentine Talking Machine Works Buenos Aires"